The free Coin Collectors Corner CoinSearch™ mobile app lets users see photos and information about specific coins available at the Baltimore Expo. (Baltimore, Maryland) – The first mobile application of its kind for collectibles, Collectors Corner CoinSearch™, will be available free during the upcoming Whitman Baltimore Coin & Collectibles Expo. 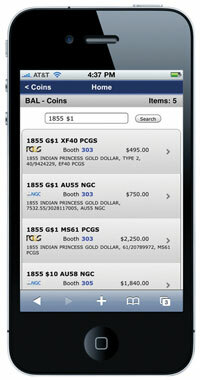 The unprecedented mobile app will let collectors instantly locate specific coins they're looking for at the show, June 28 - July 1, 2012. The new service from Certified Coin Exchange (CCE) uses state-of-the-art mobile technology and is compatible with all mobile devices. The Collectors Corner CoinSearch free app is available at m.collectorscorner.com. 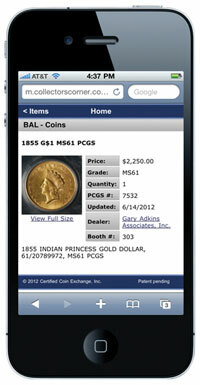 Collectors and dealers can use the free Collectors Corner CoinSearch™ mobile app to instantly locate Baltimore Expo dealers who have specific coins in inventory. "The app was successfully beta tested with great results at the recent Long Beach Expo, and we're now offering it for collectors and dealers at the Baltimore show," said Cassi East, President of CCE, a division of Collectors Universe, Inc. (NASDAQ: CLCT). "Coin buyers will be able to use their smart phones, iPads or other mobile tablet devices to find the exact coins they're seeking during the Baltimore Expo, and even prior to the show. They'll also be able to immediately pinpoint the exact bourse floor locations of the dealers who have those specific coins in their inventory." Before the show, dealers can list coins in their Collectors Corner inventories that they'll have at their Baltimore tables. Collectors and other dealers then can use the Collectors Corner CoinSearch mobile app to easily locate any coins they're seeking. The ability to post Collectors Corner listings in the Baltimore Expo CoinSearch data base at m.collectorscorner.com will be available for all CCE member dealers at no additional charge as part of their CCE membership. "This is an incredible, free service for collectors to locate exactly what they're looking for. Everyone can use it," said David Hall, President of Collectors Universe. "Mobile apps are the future, and this is a great collaboration between dealers, collectors and show promoters to bring together buyers and sellers." Additional information about the Whitman Baltimore Expo is available at www.whitman.com/expos. Additional information about the Collectors Corner CoinSearch app m.collectorscorner.com is available by calling Collectors Corner at (888) 469-2646 or by visiting www.collectorscorner.com/marketnews/?name=CoinSearch.